The exact origin and purpose of this manuscript is uncertain. It was begun in the 13th century, and added to in the 14th and 15th centuries. Most of its contents relate in some way to Ely Priory--many of them relating to a variety of private and public devotions--so it was presumably handed down from one Priory official to another. It appears to be a prayerbook, assembled for personal devotion. 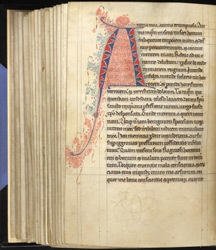 This manuscript contains a wide variety of styles of decorated initial. This 'A' is formed of red and blue jigsaw-puzzle-like pieces, combined with unusually fine and dense penwork ornament. It is in the book's second section of the 'Prayers and Meditations' of Anselm, Archbishop of Canterbury (1033-1109), both of which were written by the same scribe. It is hard to say why later material was placed between the two sections of the 'Prayers and Meditations'.